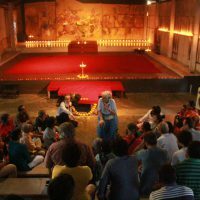 From January 2017 Indianostrum, the wonderful Pondicherry theatre troupe, created and run by Koumarane Valavane, that we discovered in January 2016 and decided to support, is working on a major project in France, at the Théâtre du Soleil. 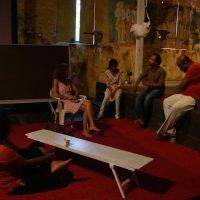 In January 2016 Indianostrum hosted the first rehearsals of what would become Ariane Mnouchkine’s La Chambre en Inde (house in India) performed at the Théâtre du Soleil (at Vincennes’ Cartoucherie) from 10 April to 25 June 2017. It is now the Compagnie du Soleil’s turn to welcome them. 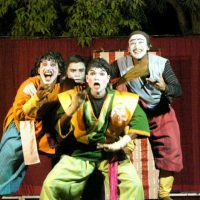 Inspired by the famous Mahabharata epic, this tragedy is based on texts by Rabindranath Tagore and Jean-Claude Carrière. 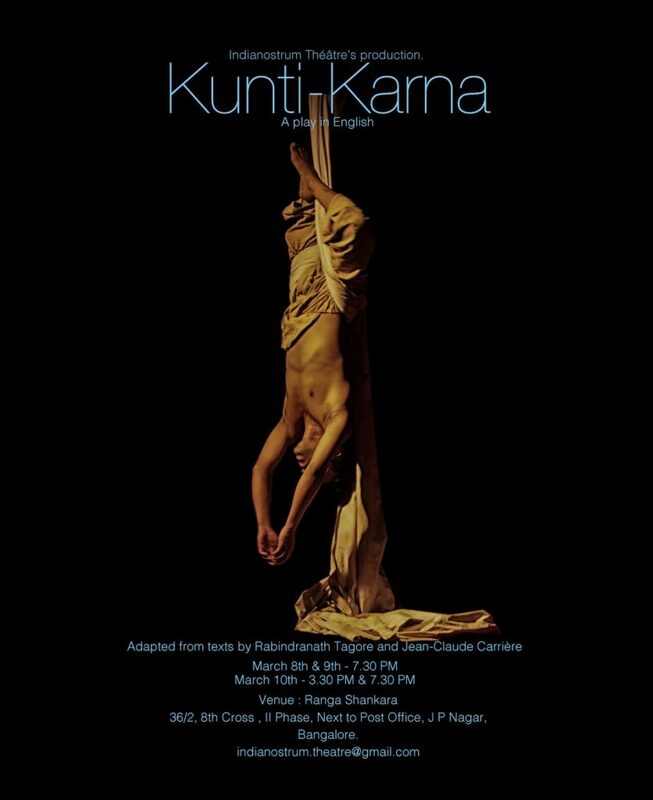 A show focused on abandonment, identity and martial arts, Kunti-Karna, unravels the thread of Kunti’s fate, a mother who gave up her illegitimate son, Karna. The son then became a great warrior and was eventually killed by his half-brother. 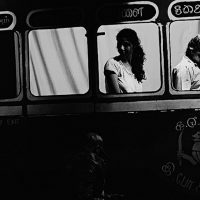 This moving project was born in 2009, inspired by the situation of the Tamil men and women caught in the throes of war in Sri Lanka. 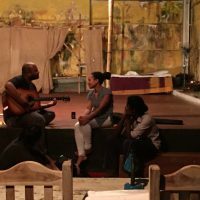 How to create something in real time about this tragedy whilst being caught in the midst of so many emotions? How to distinguish the feeling of injustice from that of hatred? How to justify the death of the innocent and the inevitable aftermaths of battles between good and evil? 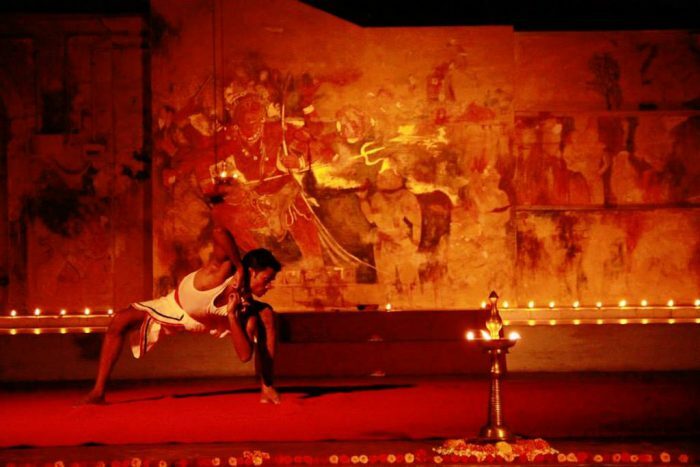 Karuppu is a theatre show danced to a music by Jean-Jacques Lemêtre, composer and musician of the Théâtre du Soleil. 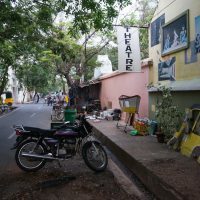 the Alliance Française in Pondicherry, the Théâtre du Soleil, the ARTA non-profit organisation of the Cartoucherie, the Conservatoire National Supérieur d’Art Dramatique de Paris, the India Foundation for the Arts, the Institut Français in Paris, the Paysages Humains non-profit organisation, Editions Zulma, ONDA. 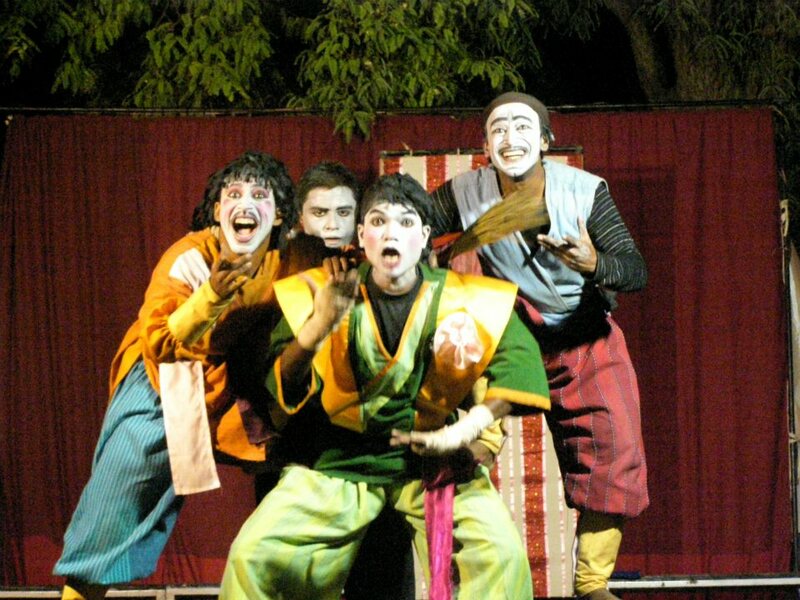 Many of you know my passion for theatre, my journey and this incredible adventure, the Indianostrum theatre, a troupe initially born in Luminy in 1997 then resurrected in 2007 in the south of India. 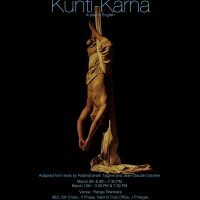 This year we are welcomed at the Théâtre du Soleil from 4 April to 4 June to perform three of our shows: Kunti-Karna, Terre de cendres (land of ash) and Karuppu. First of all, I would like to thank those of you who have already contributed. Our one and only concern has always been funding, nothing else! 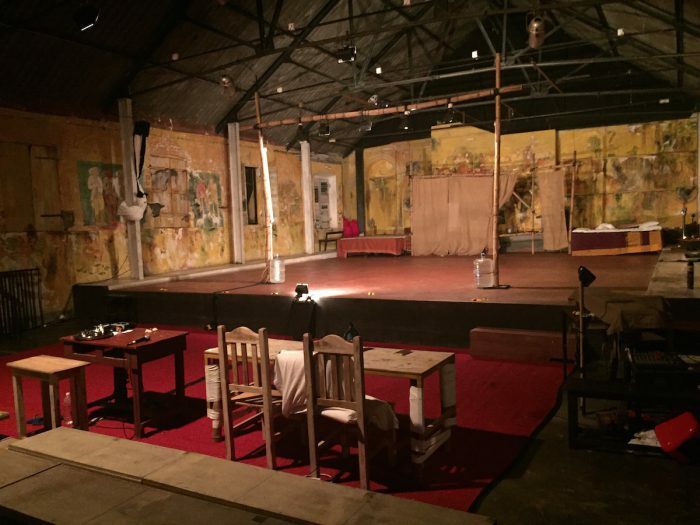 Because we have a magnificent place in Pondicherry, dedicated comrades and we are driven by an inexhaustible desire for theatre… as well as a certainty that increasingly guides us: theatre is going to be one of the last refuges in our society to reflect upon our troubles and to dream of a more beautiful world. 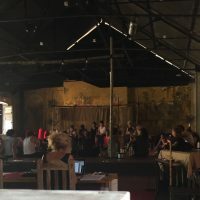 Telling stories, talking about dreams, healing our sorrows, welcoming the public, sharing our passion with children, addressing the senses and seeking poetry or inner music of each of us… Inviting the other to vibrate, yes! Vital because it gives us all the means to carry out this fight to practice our art with dignity. I thank your from the bottom of my heart for believing in us and to supporting our adventures again and again. Be sure of our victory because we have a secret which is also a formidable weapon: Theatre. Whatever your contribution (even simply sharing this message), I will always feel supported by friendship. As far as we’re concerned, at last things are looking brighter. I shared this good news with everyone in the troop and we are all really happy about it. I have attached to this email the scanned receipt of your donation for which I would like to thank you on behalf of the whole team. Could you please give me your postal address so that I send it to you by mail? 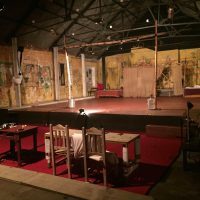 The company played Terre de cendres until late February. 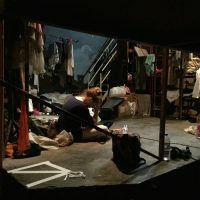 Here are two reviews of the show. 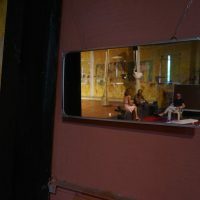 Throughout this month, we are going to film our play to offer it to festivals. 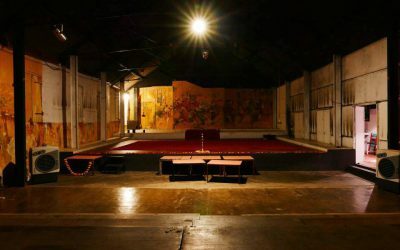 From May 1st and for two months, part of the team is going to train with a renowned master in a sort of popular theatre in a village. 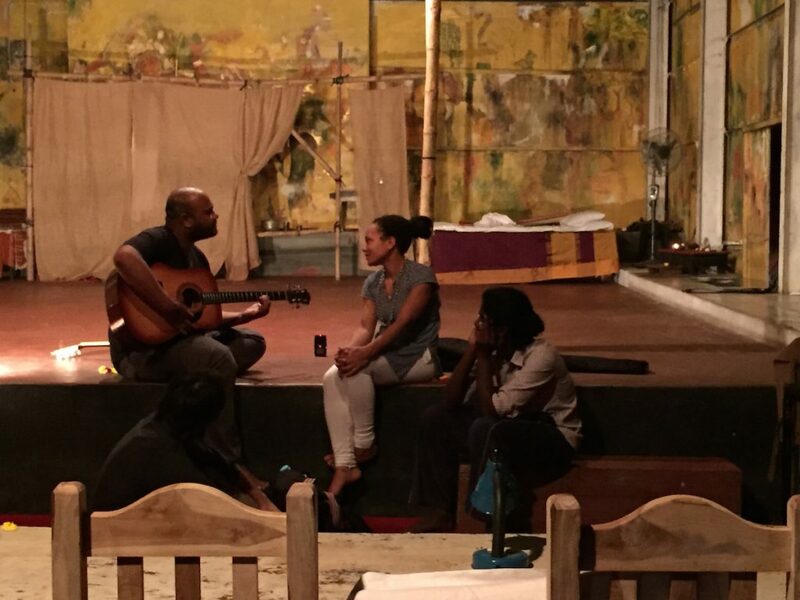 Then we are planning to present a small project we have been working on, about Ophelia, as part of the “Hamara Shakespeare” festival at the end of June in Chennai. We will then perform this play throughout July in our own theater. From September a girl who used to run an acting school in Mumbai will join us as the administrative manager of the company. I think this we should primarily focus on developing this aspect. It would mean that, at last, we have someone with the skills to run our company, my administrative alter ego so to speak. 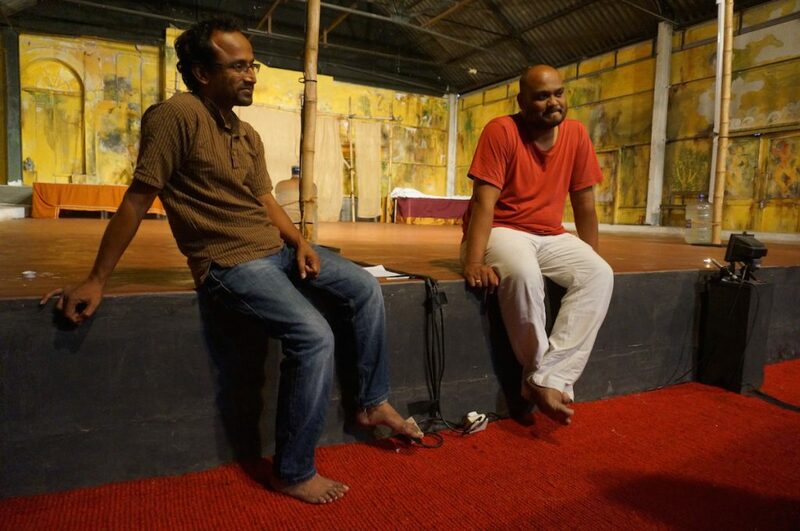 The Indianostrum theatre company was created 7 years ago by the French-Indian director Koumarane Valavane. 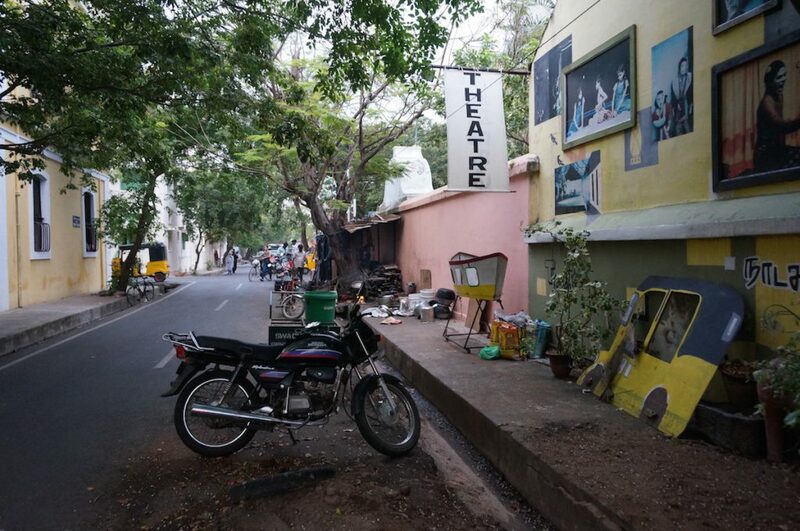 After facing the difficulties involved in setting up a small theatre company, in Pondicherry, Indianostrum has been running a small theatre space since 2012, in what used to be a French film theatre called “Salle Jeanne d’Arc”, which previously ran for 80 years. Its full name will therefore be: Indianostrum “Pathe, Cine Familial”. 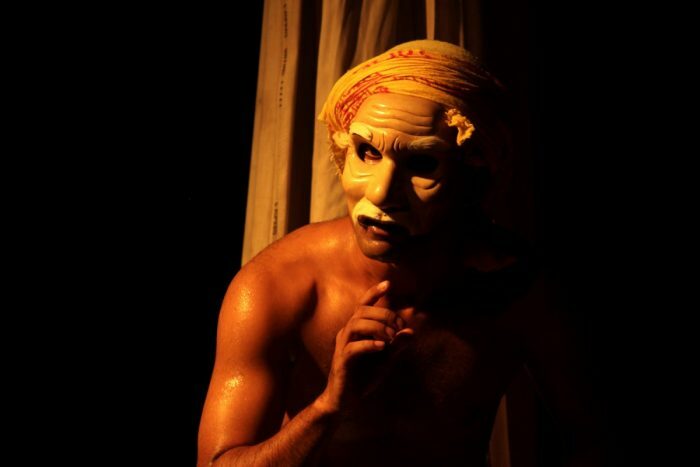 Indianostrum aims to promote modern theatre as part of the country’s cultural life, developing new texts that highlight the specificities of modern Indian drama and exploring the connections between all traditional forms, transcending political, historical and social divisions. 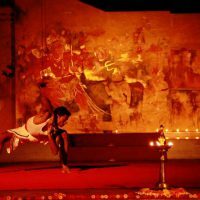 From Dec 14 to 30, 2015, Indianostrum is welcoming Ariane Mnouchkine and 12 members of her Théatre du Soleil company for a series of workshops in its Nomadic School. 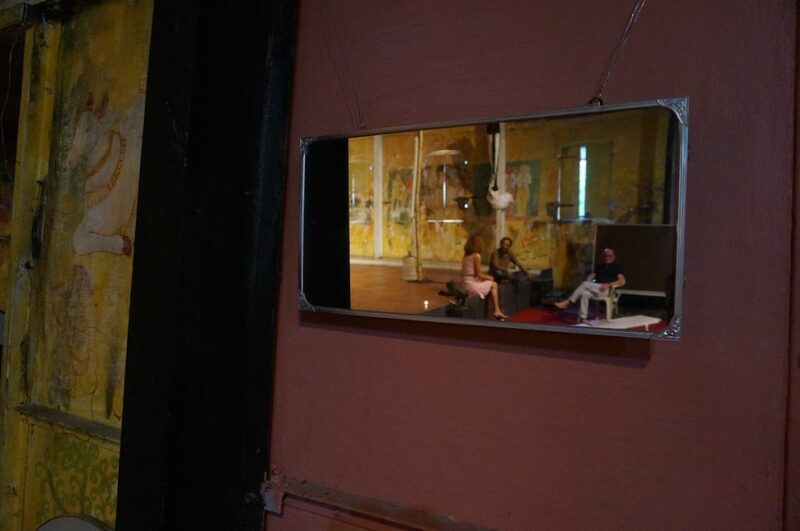 Unfortunately, in 2013, the theatre was seriously damaged through a fire. Thanks to Valérie Joly (music composer and performer) we learned about the hard work of this brave company. We will meet them on January 24 and 25, 2016 to estimate and define together our commitment towards them. 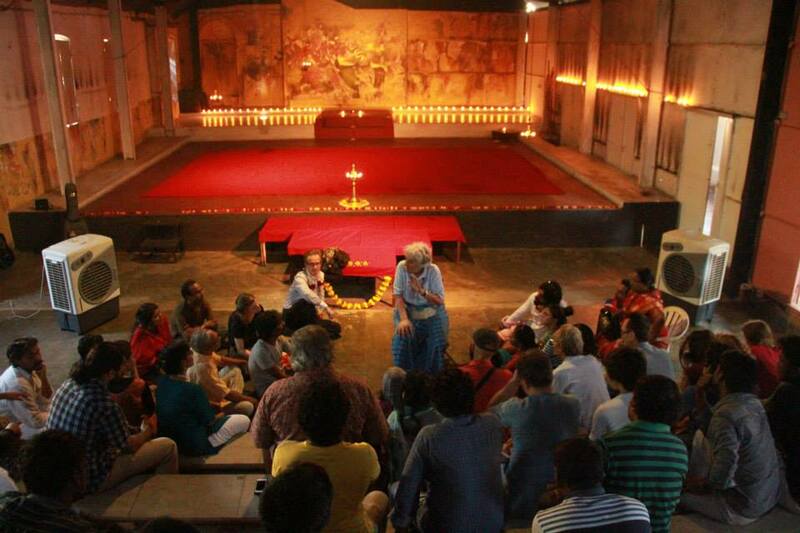 Our visit to Indianostrum, Pondicherry, in Tamil Nadu, one of the largest states of South India, on 24 and 25 January 2016. 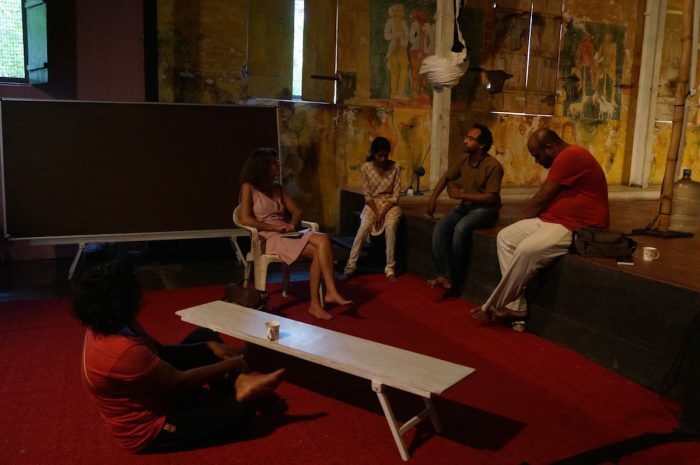 Here we were with Koumarane Valavane and his small team, sitting down, drinking tea in a beautifully painted theatre. 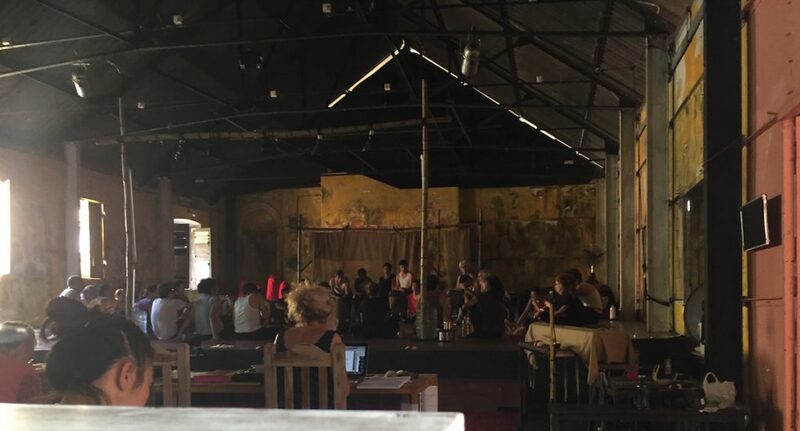 A small and courageous team, full of energy, laboring to welcome Ariane Mnouchkine’s group (Le Théâtre du Soleil and La Cartoucherie, Paris) who had just started the first rehearsals of her new play right here. 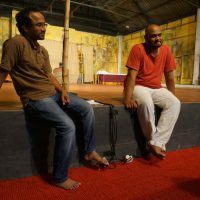 Indeed, since December 2015, about 15 actors and musicians successfully carried out workshops attracting more than 80 “trainees” from all over India. 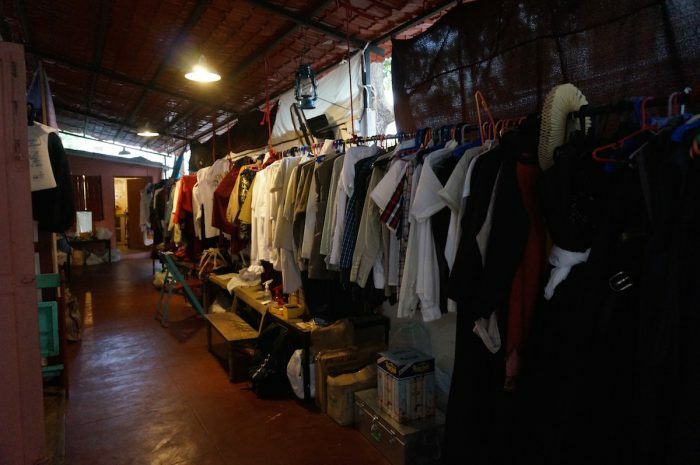 Rows of costumes in the entrance hall… The stage stripped of its decors left a bare space for inspiration and research work. We thoroughly enjoyed the creative vivacity! 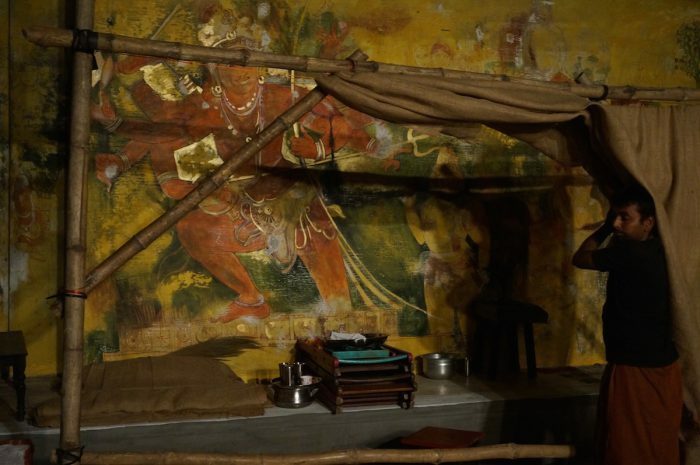 However, that Sunday in Pondicherry, everyone was out and about, which meant we were able to quietly listen to Koumarane telling us about his aims, past difficulties (including the fire that destroyed more than 60% of the equipment in 2013), and his new adventure. A new and long-term initiative, which will enable these artists to tour and promote modern forms of drama whilst maintaining the tradition of folk theatre: the creation of a travelling theatre, just like Moliere’s, on the roads of Tamil Nadu, will enable them to explore, practice and eventually transcend traditional forms of drama. 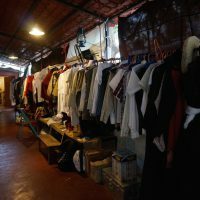 Indeed, every year folk shows spread across villages though numerous festivals. According to the tradition, they must last all night long. 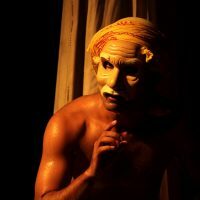 Thus, from April to September 2016, Indianostrum’s project will entail finding its path through these country areas and improving its practice whilst performing traditional forms of folk theatre. For the rest of the year, back in Pondicherry, the Indianostrum company will be back on its own stage, performing or presenting other shows. 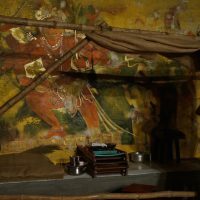 Public subsidies and institutional support are scarce in India and 45% of his budget is covered by donations (with an annual budget of €30 000). 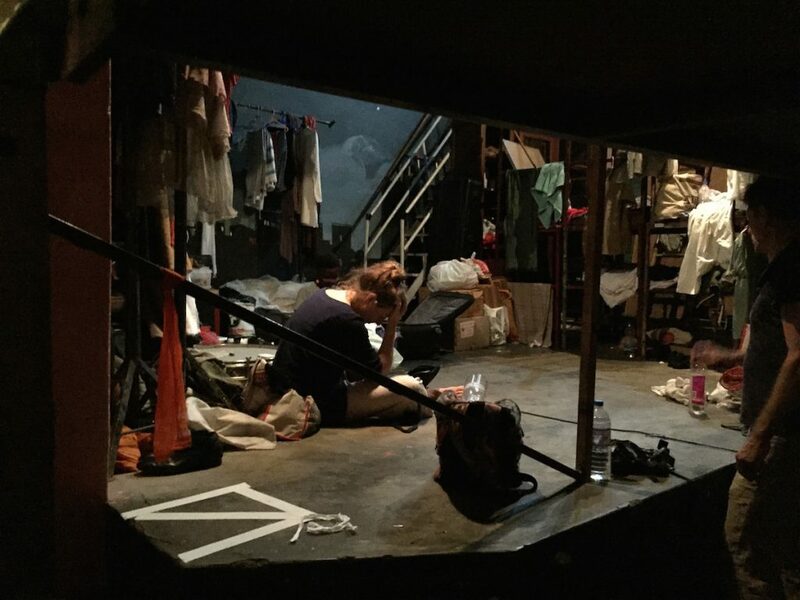 We therefore started (what we hope to be) a mid- or long-term partnership with this theatre. To this day, we have supported their efforts through the donation of €2000 and we shall give them an extra €700 in a few weeks time. This total of €2700 represents one month of the company’s total wages.